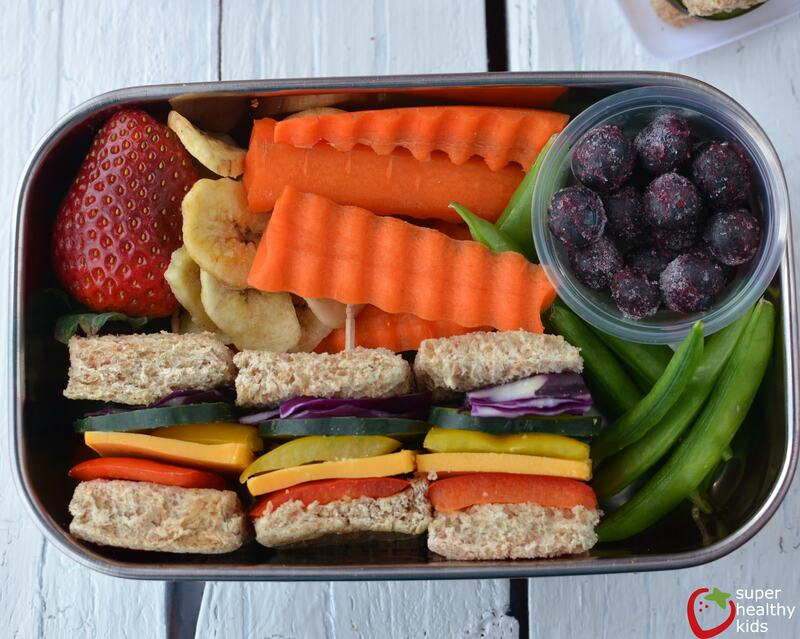 When you are looking for lunch box ideas, consider your fruits ad veggies first. 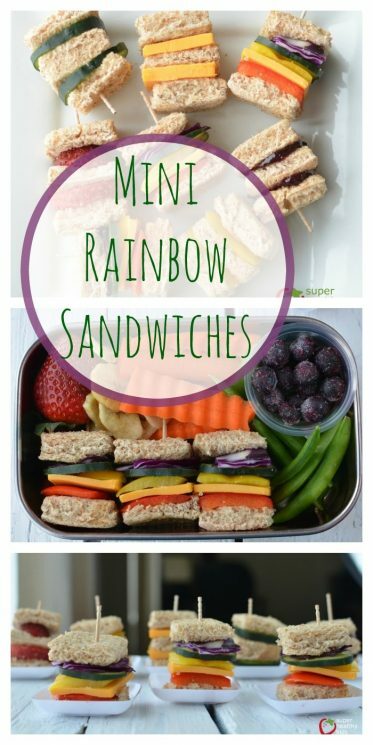 Eating a rainbow is something we talk about a lot at our house! The beautiful, natural colors of fruits and vegetables all offer different phytochemicals and antioxidants necessary for optimal health! Red=beets, bell peppers, red apples, cherries, tomatoes, strawberries etc. Strong in the phytonutrient lycopene and Anthocyanin, vitamins A and C. Known for controlling high blood pressure, reducing risk of cancer, and reducing risk of Alzheimers. Dark Green/Green=Kale, Spinach, leafy greens, broccoli, Honeydew, peas, kiwi. Strong in Lutein and Indoles also fiber, potassium, folic acid and some B vitamins. Known for maintaining good vision, reducing risk of tumor growth in cancer patients. Yellow/orange=Carrots, sweet potatoes, pumpkin, apricots, oranges, grapefuruit, pears, pineapple. Known for being high in Beta-carotene and bioflavonoids, fiber and vitamin A. Benefits are boosts immunity, reduce heart attack risk, maintain strong bones and teeth, better skin. Blue/Purple=Blueberries, blackberries, grapes, raisins, plums. High in Anthocyanin and phenolics. Benefits are reduction of age related memory loss, controlling blood pressure, slowing the effects of aging (I like that one). White=Garlic, potatoes, onions. High in allicin, fiber, potassium. Benefits are lowering cholesterol, reduces spread of cancer. 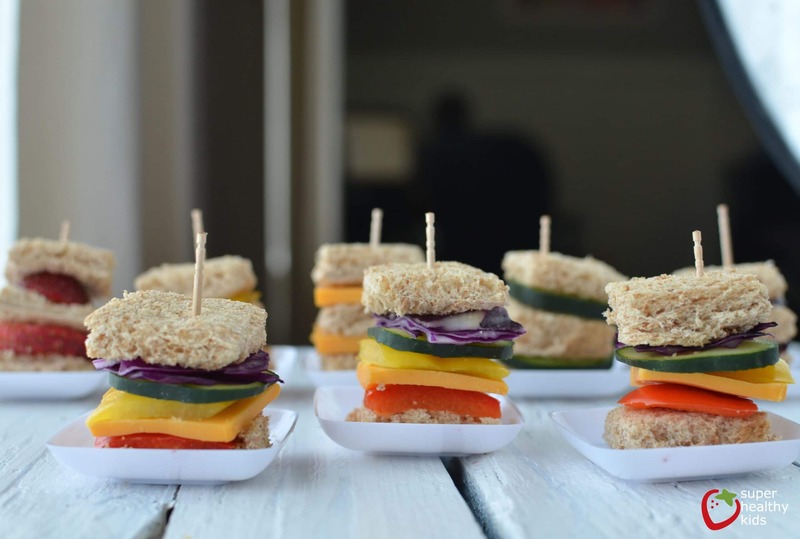 So, these sandwiches help kids get all those nutrients!! Plus, they are super delicious, and fun to make. 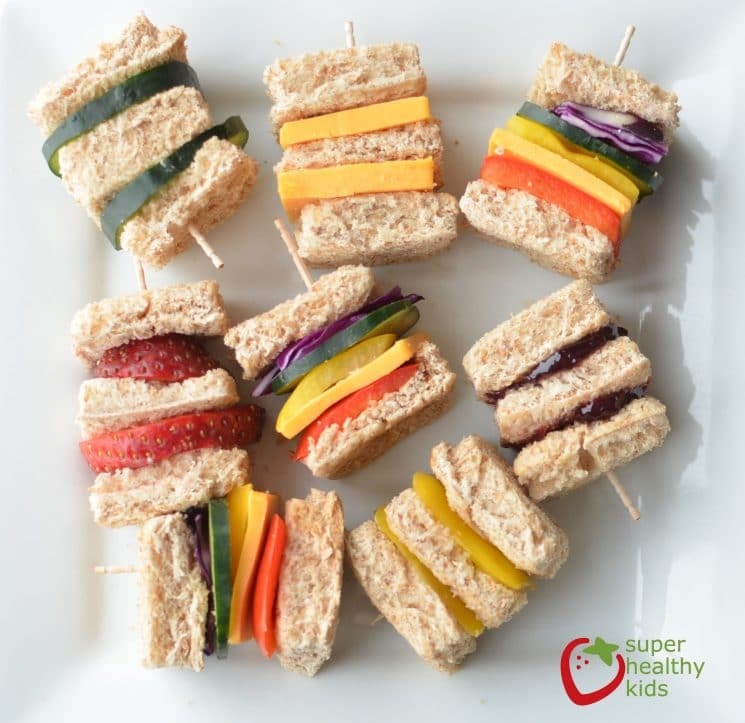 Whole wheat bread, sliced into squares, or use a square cookie cutter. 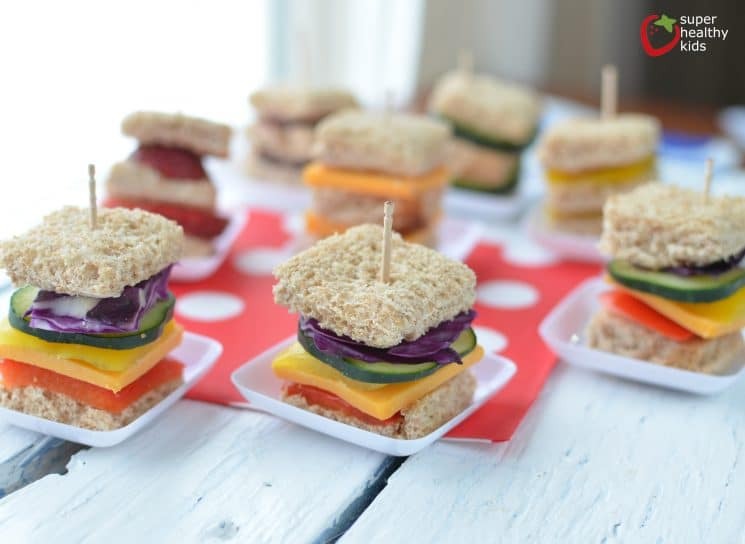 I love all the lunch ideas.